In anticipation of the ratification of the CPTPP, Canada Beef Japan and the Canadian Embassy jointly organized a beef-focused promotion event in Tokyo, with cooperation from Ontario Corn Fed Beef (OCFB) and the Alberta Office in Japan. The presentations aimed to further raise awareness of Canadian beef, its taste and advantages among retailers, food-services, distributors, importers and media. 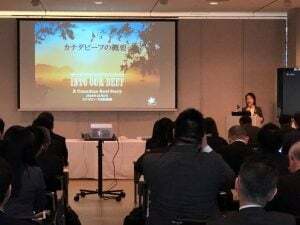 The event also aimed to convey the benefits to Japanese customers of Canadian beef along the entire distribution channel. The space at the Embassy was packed with 130 guests and a reception followed the seminar. Opening remarks by Dennis Laycraft of the Canadian Cattlemen’s Association (CCA) and presentations by Canada Beef, the Canadian Embassy, Alberta Japan Office, and OCFB all combined to give a dynamic overview of Canadian beef. Mathieu Paré from the Canadian Beef Centre of Excellence conducted cooking demonstrations using chuck eye, outside skirt, and striploin that successfully animated the entire event. The guests enjoyed eight Canadian beef dishes including Mathieu’s recipes at the reception. At his specific request for events focused on Canadian beef in Japan, Hon. 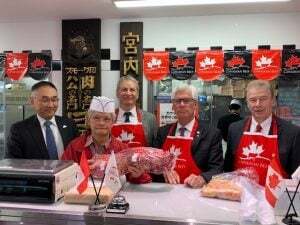 James Carr engaged a discussion with Japanese beef representatives and participated in a beef promotion event at Nissin World Delicatessen, a high-end department store that carries Canadian beef. The event included a tasting of both Canadian striploin and tenderloin. Subsequent articles in trade journals were all focused on the improved access for Canadian beef under the CPTPP and the world-class quality of Canadian beef. The Supermarket Trade Show in February is the biggest food show in Japan with a focus on supermarkets and is extremely well attended by professional trade people, with about 90,000 visitors over three days. Canada Beef in Japan displayed samples from three packers: Cargill, JBS, and Montpak (chuck eye roll, tongue and hanging tender) and food sampling was conducted three times a day. This was the first food show since the 11% beef tariff reductions came into force under the CPTPP and trade partners, media and the public were focused on beef imports in general and Canadian beef in particular. They were particularly interested in the advantages of Canadian beef in comparison with other competitors. Canada Beef and the Japanese packer representatives had excellent meetings with potential retailers. 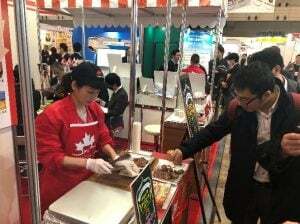 As the import volume of Canadian beef to Japan in January increased five-fold compared with the same period a year ago, TV Tokyo, one of the major broadcasters, spent about 4 hours at the Canada Beef booth and aired a program on their 11 pm business show focused primarily on Canadian beef. 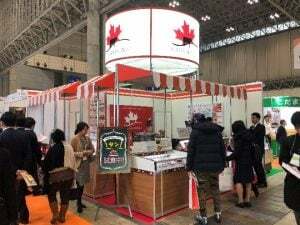 The ball really got rolling at the Tokyo Supermarket show in February, where Tokyo TV spent over 4 hours at the Canada Beef booth interviewing and filming an overview that aired on their popular business show. Media attention again generally focused on the growth and importance of Canadian beef exports to Japan. As a result of the growing media and consumer attention to Canadian beef, the Canada Beef booth at the Canadian pavilion at Foodex in March was a hotbed of activity with daily tastings of Canadian beef a popular attraction. News articles that highlighted the increase in Canadian beef exports to Japan attracted serious media, trade and consumer interest to Canadian beef. 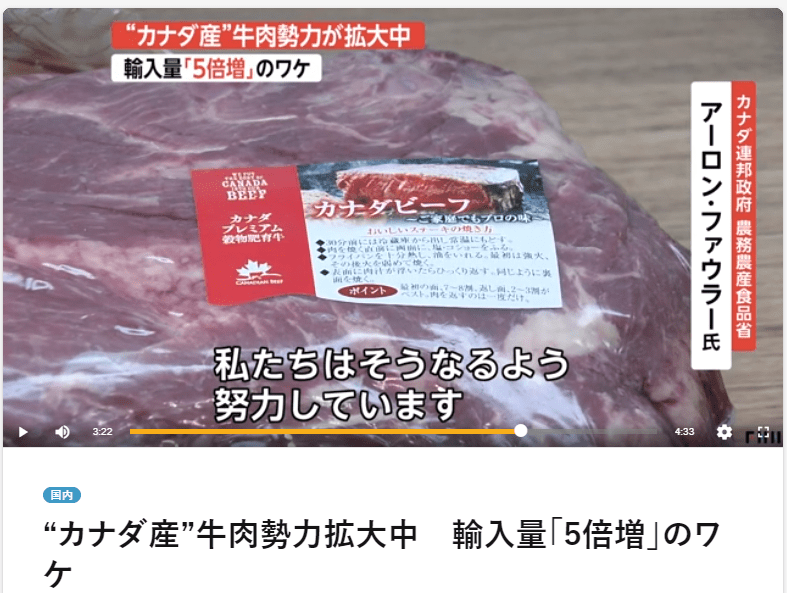 Fuji TV aired an extremely complimentary five-minute overview of Canadian beef on their prime time news program, which provoked even more attention to the Canada Beef booth on the final day of the show.